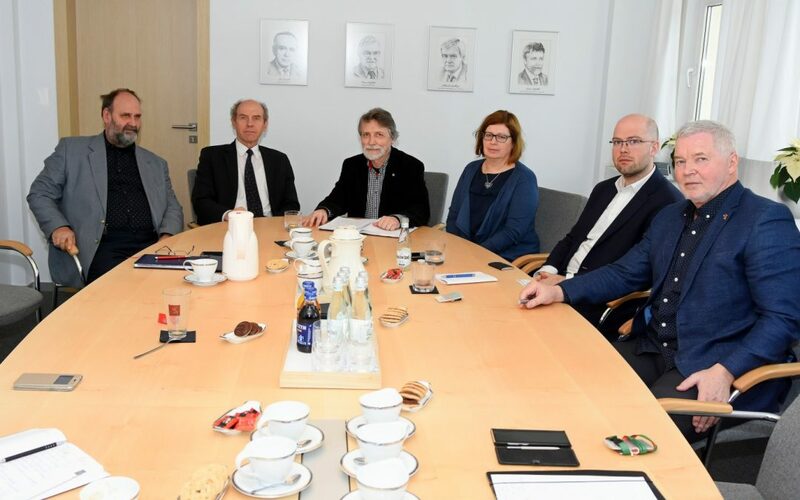 On 25 Jan. 2019, Janusz Różalski – CEO of OPEC Gdynia (the third from the left) organized a meeting with a Member of Polish Parliament (Dr Jan Klawiter – second from the left) focusing on efficiency in Polish district heating (DH) grids. The participants (including Mieczysław Dzierzgowski – Asst. Prof. WUT, Marcin Gregorowicz – energy adviser WFOS Gdańsk, Joanna Wojtkowska-Paszak – OPEC specialist and Adam Cenian – Prof. IMP PAN) discussed the state-of-art of DH in Poland. Performed renovation of most buildings led to grid hydraulic overestimation, oversupply of heat flux to flats and too high return temperature. This precludes the possible gains in heat efficiency and reduction of fuel consumption. However, the observed overestimation of pipe diameters may enable easier transformation of DH to LTDH (or 4G DH). Dr Dzierzgowski found in his studies, that by regulating and temperature lowering in the heat grid (in Lomża, city in eastern Poland), it is possible to decrease heat supply to buildings (above 20%) and DH grids (10%). By decreasing the supply temperature below 100 °C the grid losses decline up to 15% i.e. to ~ 10% of heat supply.